Cherry wood cabinets are among the most widely used in modern home design. The wood is highly durable, and its natural color is visually appealing enough that it doesn’t require paint or stain to work with most decorating styles. Since the color itself tends to be dark, you need to accent cherry wood cabinets correctly to avoid a kitchen that is too stark or severe. 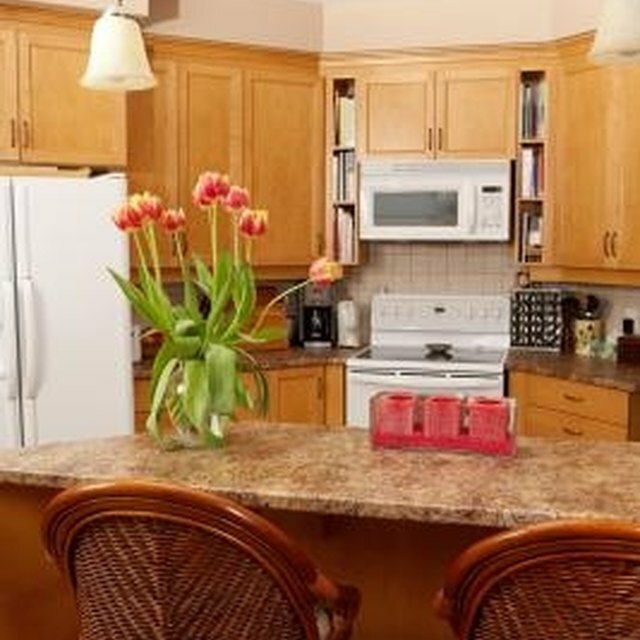 You have a variety of ways to decorate with cherry cabinets. Cherry wood has a naturally dark finish with warm red undertones. When working with dark colored cabinets, keep paint light in color to prevent the space from feeling small or closed in, which is especially important in small kitchens or those without much natural light. Select a shade of white -- cream, eggshell and similar tones -- or a neutral with a bit more color, such as beige or taupe. Each of these will reflect light, make the room feel larger and work to contrast the darkness of the cabinets. Pastels and neutrals, particularly mossy green and light blues, also work to create a warm, soothing space. The color of appliances will be determined primarily by the overall look that is desired in the room. Stainless steel appliances are among the most widely used and are ideal for creating a modern style kitchen. This is a material that will require regular cleaning since fingerprints and smudges will be very noticeable. Special ordering a refrigerator and other appliances with a paneled front is a second, fairly new option. This design incorporates panels with the same style and finish as those used on the cabinets. Avoid black appliances as they will most likely be too dark for the space. As with wall color, floor color and style are essential elements of kitchen design. Ceramic tiling is a fairly low-cost option that is available in a variety of colors and is durable enough to withstand the wear and tear of the kitchen. Slate tiling is a very modern choice and, like ceramic, is both durable and versatile but carries a higher price tag. Concrete that is painted, stained or decorated is a good choice for the kitchen. It is very durable and can be designed to fit just about any decorating style or color scheme. Selecting the right hardware will give a polished look to the kitchen. These pieces are available in a wide selection of colors and styles, and there are several that will work well with cherry wood cabinets. Stainless steel or chrome will add a nice contrast to the dark wood and will work well with matching appliances. Gold or silver will work similarly well, depending largely on the wall and floor color; warm or bold tones tend to favor gold while cool or neutral tones lean more towards silver. Select colored glass for an eclectic feel and a choice that will work equally well with most color schemes.